Camber Option: Powder-S 3D Camber. A rockered nose that has a 3D shape or beveled base into a set back camber. Conditions: Overcast skies, puking snow, low visibility, 6 plus inches of snow, and above average temperatures. Flex: For being a short, fat, powder board this is on the stiffer side. What I found was a softer nose that stiffens up through the tail. There is a lack of torsional flex, but this is more in part due to its width. Overall I would put it above a middle of the road but below a full blown plank. Stability: The added girth of this board is where you get a lot of your stability. Then when you add in camber you have a recipe for stability. It plows through chop with ease, partly due to its width and partyly because of the carbon rod in the nose that aids the board in smashing snow and funneling it out to the side with the 3D nose. I did get a little bucked around in deep aggressive powder moguls, but that was probably more my fault as a rider and less the board. Ollies/Pop: You can really load up the tail on this board and pop. The camber is highly abundant and with the added width you have a platform that makes it easy to snap off of. Butterability: I tried a few 180 nose butters and found that this board just snaps you right out of them. This is more a result of the carbon rod in the tip than anything. If you really push into it and force yourself you’ll lock in just fine. Carving: Edge to edge transmission is great with this board. I did find that railing hard deep carves it just wasn’t the most ideal, but that’s not what this board is made for. 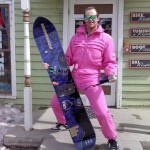 Rider in Mind: The guy that wants a short fat stubby pow board with camber. Personal Thoughts: So here’s the thing with this board it reminded me a lot of riding a K2 Cool Bean, it was snappy off the tail, plowed through snow with ease, and could turn if I wanted it to. What set it apart though was the pop off the back foot and how aggressive the nose is when plowing through snow. In tight trees it rips a turn through the banks and never looks back. I’m curious about the Pin Tail model, do you have any plans on reviewing that one? We’ll see what Rome sends in the future. You reviewed the swallow tail it looks like but the pictures on the video are all of the moon tail right??? This is why you never edit with a concussion. Friend is 140lbs, would you go the 140MT or 153MT? Size 8 boots. This or DC House of Powder? Looking for a bit of groomer performance as well. Looking to do a whole season in Canada next winter and looking for something more focused towards backcountry riding than my current board. Probably go with the MT. Cool thanks! Do you reckon I’d be ok on the 153 or better off on 140? Quite a big difference in the two sizes! I’d probably do that 53 for what you’re looking for.